Name of the last treatise of Seder Zera'im. It treats of the way of carrying out the commandment concerning first-fruits mentioned in Deut. xxvi. 1-11. The commandment includes two things: (1) the bringing of the first-fruit, and (2) a declaration to be made by him who brings it, that he owes everything to the kindness of God toward the Israelites, from the times of the Patriarchs up to the present day. The treatise deals with this subject in three chapters. Chapter i. deals with the conditions that necessitate the bringing of the first-fruits. The Mishnah enumerates three classes of landowners: (a) Those that can not bring the first-fruits, either because the fruit is not entirely the product of their land, e.g., when part of the root is outside their land; or because they are not the real or the legitimate owners of the land; or because the produce of their land includes none of the seven kinds enumerated in Deut. viii. 8, or is only of inferior quality unfit for bikkurim. (b) Those that bring the first-fruits but do not make the declaration; viz., proselytes, freed slaves, guardians who manage the property of orphans, delegates, females, half-males, and undeveloped persons (Androgynos). (c) Those that gather and bring the first-fruit and make the declaration; viz., the owners of land (including those who have bought three trees growing in another man's land) producing some of the seven kinds, of average or superior quality; provided they bring the first-fruit between the Feast of Weeks and the Feast of Tabernacles. When brought after the festival, the declaration must not be made. In chapter ii. a comparison, as to legal classification; is made between "terumah" (given to the priest), "ma'aser" (the second tithe, which had to be brought to Jerusalem and consumed there), and "bikkurim" (to be brought to the Temple and given there to the priests). Other similar legal comparisons are given: between citron, trees, and vegetables; between the blood of human beings and that of cattle and creeping things; and between beast, cattle, and "koy" ( ), an intermediate between cattle and beast. Chapter iii. contains a full account of the way the first-fruits were brought to the Temple. A fourth chapter, containing a comparison between the laws referring to man, woman, and androgynos (intermediate between man and woman), has been added by some of the editors of the Mishnayot. It is part of the Tosefta Bikkurim. The Tosefta by this name contains two chapters on a line with the Mishnah. 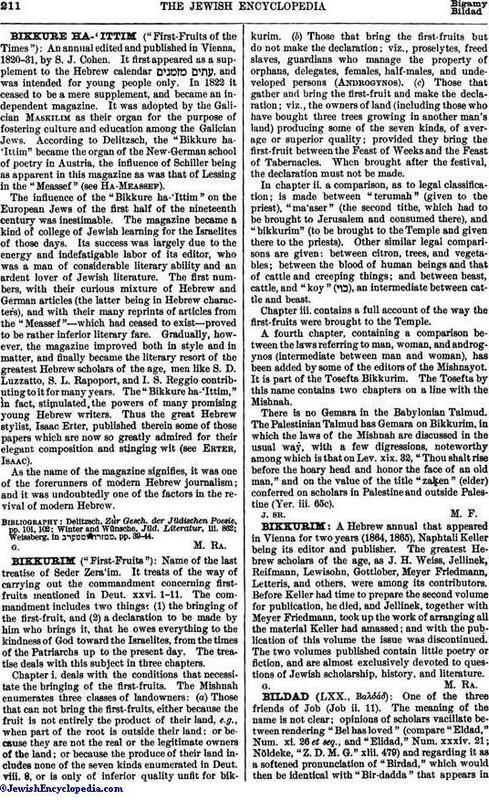 There is no Gemara in the Babylonian Talmud. The Palestinian Talmud has Gemara on Bikkurim, in which the laws of the Mishnah are discussed in the usual way, with a few digressions, noteworthy among which is that on Lev. xix. 32, "Thou shalt rise before the hoary head and honor the face of an old man," and on the value of the title "zaḳen" (elder) conferred on scholars in Palestine and outside Palestine (Yer. iii. 65c).